Llewyn has an unsuccessful night at the Gaslight club due to his own arrogance and rudeness and then spends the night on a friend’s couch. 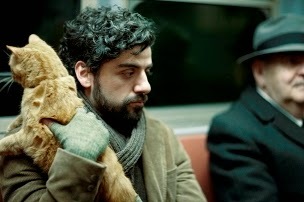 This leads to their cat escaping in the morning, and Llewyn once again finds him homeless, but this time with an adopted cat. Things don’t go well for Llewyn, and things go worse for the cat. As an animal lover, this is usually really bad news, but the Coen brothers managed to portray this adopted cat with a very loving but grimly realistic approach, and it ended up being quite acceptable. Llewyn’s main fruitless relationship is with Jean (Carey Mulligan), the wife of Llewyn’s friend and more successful folk artist. In one of the livelier scenes, she informs him that she’s pregnant and proceeds to deride him with how he should proceed in his life – wear two condoms at all times so he will never, ever get someone accidentally pregnant again. Llewyn’s going to take care of it, because, well, this has happened to him before and he knows a doctor. 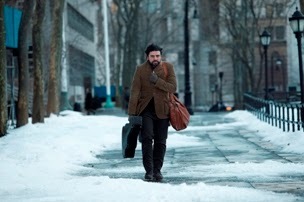 Llewyn’s journey involves trying to get gigs at the Gaslight, trying to get money out of his agent, trying to take care of Jean’s unborn baby, and ultimately, trying to get to Chicago to land a record deal. Llewyn does see a reasonable level of success. 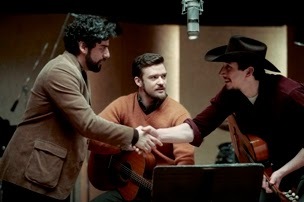 In another lively scene, he lands a gig on recording the song “Please Mr. Kennedy” with friend Jim (Justin Timberlake) and fellow musician Al Cody (Adam Driver). It’s a great song, with a very humorous take on the social culture in 1961, and left me singing it for hours to come. The brilliance of “Inside Llewyn Davis” doesn’t come through until the end when he has another unsuccessful night at the Gaslight club due to his own arrogance and rudeness and then spends the night on a friend’s couch. His journey is circular much like the music industry and the popular songs which he never did get to sing.